This redesigned facade for a 5 Marla Residence is surprising, displaying a cuboid, compact shape. 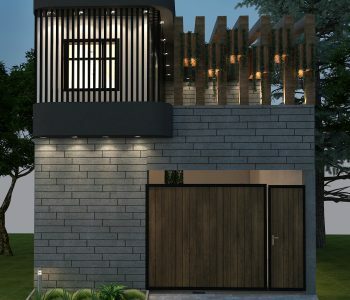 It is made appear both minimalist as well as trendy at the same time as we believe the facade of the house is what defines it even before you get to experience the interior, all due to the best industry leading architects are working with their full strength to provide the best architectural services. The use of minimum variations in material and volumes make the overall elevation look clean while the simple form with added louver feature gives it a contemporary and modern look. The sleek elevation beautifully combines the wood paneling with the compelling shades of grey. The subtle exterior for this house is a bold attempt at pairing the grey stone with wood to create a classy ambiance and compliment this modern home’s facade and architecture at the same time. One of the nicest things about grey cladding is the way it blends into any surrounding. Against the soft backdrop what draws attention is the protruding balcony that sticks out as a distinct volume in contrast to the plain façade. It is highlighted with the darkest shade of grey to exude elegance and make a strong statement. The wooden slats holding the elegantly designed planters have been used to not only give it a contemporary look but also to create privacy and shade for the hallway while allowing natural light and air to flow inside. Light breaks through the horizontal louvers and makes the space inside alive and create a sense of playfulness throughout the day. Also in contrast to the solidity of the grey cladding, it makes the transition between the interior and exterior areas smooth and seamless. It is actually the interesting balance of materials and the simplicity of form that makes this façade unique and eye catching. The house is intended to be environmentally conscious and to provide comfortable, efficient living spaces.